The brain behind Brain ~ Journal of a dreamer. Considering that ahjussi wasn't even the first choice for the role (first choice was Song Seung-hun), he really did a damn marvellous job in this drama. 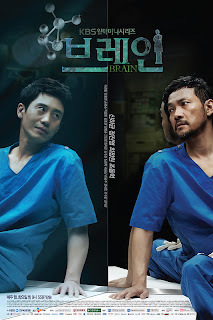 Dr Lee is really made for Shin Ha-kyun, and Shin Ha-kyun is perfect for Dr Lee. I really love this poster. It's supposed to be a mirror image. Dr Kim sees himself in Dr Lee. Like what Dr Kim said, Dr Lee was his past.